There is a real and frightening conundrum that has arisen from the Great Recession. It is the IOR Conundrum. What are we to make of payment of interest on excess reserves (IOR), held for the banks by the Fed. In a nutshell, the Fed says a floor must be created under the Fed Funds rate, which is a form of interbank stimulus, and IOR does that, while the Market Monetarists say that the Fed made the recession much worse by paying the IOR. So, which is it? Essentially, paying interest on reserves allows the Fed to place a floor on the federal funds rate, since depository institutions have little incentive to lend in the overnight interbank federal funds market at rates below the interest rate on excess reserves. We all want to be free from the horrible Scandinavian problem of negative rates. We all know by now, I hope, that this has become a serious reality show over there in Denmark, Sweden and Norway, with the biggest Norwegian bank recently calling for a ban on all cash. We certainly don't want to try their little experiment in cashlessness. 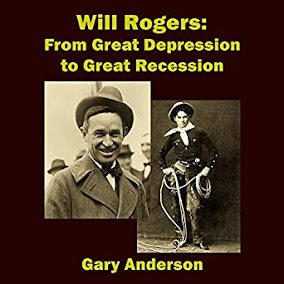 But the conundrum continues with the Market Monetarists showing pretty clearly that the Great Recession got worse because banks not only did not lend below Fed Funds rate, but they simply didn't lend at all except to big business. 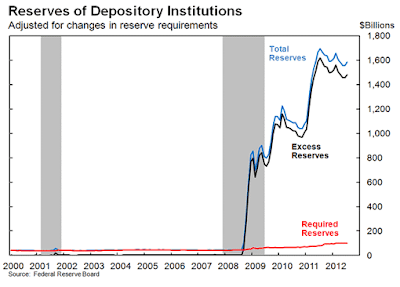 The MMers view interest on reserves as a monetary policy tightening. A steep rise in excess reserves cannot be interpreted as evidence that the central bank's actions have been ineffective at promoting the flow of credit to firms and households. Clearly, the link above to the New York Fed is interesting, showing that the excess reserves caused banks to be more willing to lend between each other but not at lower than the funds rate. In fact, the central bank paid interest on reserves to prevent the increase of reserves from driving market interest rates below the level it deemed appropriate given macroeconomic conditions. So, some say, tightening in the current uncertain period, through continued IOR and through raising short rates, is effectively driving long interest rates downward. Of course they are inclined to be low due to massive demand for the bonds,and I think that carries more weight than manipulation of the Fed Funds Rate. So, not increasing bank lending significantly is of course what drives the Market Monetarists crazy. They don't fear some of this money (excess reserves) getting out into the economy, since inflation is so low these days. They want a little more inflation, to get the economy started again. Whether their way is the wisest way remains to be seen. Slow growth is the new normal of the Fed, clearly, by word and deed. Perhaps this IOR Conundrum is the end of monetary policy. It is more like a stalemate in chess. Nobody seems to be winning, least of all the economy. Perhaps it is necessary to look for other ways to stimulate the economy, as fragile as it clearly is. Another conundrum closely linked to this one is that we would be better off with higher interest rates and lower interest rates at the same time. Higher rates would motivate banks to lend as they would see a real profit from doing so. Lower rates would stave off perception of money tightening in the US, which is real money tightening in the world that borrowed cheap dollars. Higher rates are preferred for our economy, but it is like we are separated from them by a great chasm, and no one can leap over that chasm. According to Market Monetarists, higher rates mean higher asset prices unless there is a savings glut which pushes asset prices up as rates fall. Since Higher rates cause banks to lend, forcing greater demand for assets. That helps the world economy, but not Americans so much. Since the Fed cannot buy non financial assets like REITS like the Bank of Japan (BOJ) can, raising interest rates becomes the only tool to try to jack up asset prices as a stimulus, other than QE. 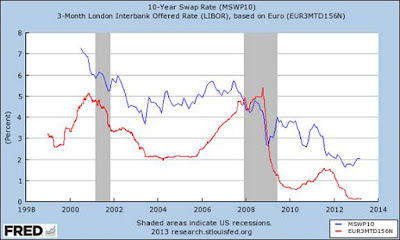 With regard to the IOR Conundrum, maybe someone should pass a law that says banks cannot lend to each other below the Fed Funds Rate, and get on with the business of loosening the money supply before emerging markets hit bottom in an ever more frequent deflationary and recessionary reality. As of now, the Fed does reverse repo operations to force banks to offer loans above the Fed Funds Rate. Otherwise, the Fed could tighten the money supply but loosen lending by the TBTF banks, by cutting back on interest on reserves. Seriously introduce that rule that banks cannot lend below the Federal Funds Rate. Reverse repos can't go on forever, but the floor is still needed on interest rates. After all there are way more excess reserves than there are treasury bills to soak up those reserves. So why not force the banks to lend no lower than at the Fed Funds Rate? No lending coupled with monetary tightening seems like a recipe for trouble. For the market monetarists, it is more about stable money than inflation or deflation. But, that debate is for the economists to figure out. Finally, regarding the creation of bubbles, monetary policy is not key, but in my observation, since I saw it happen in Nevada, easy terms for loans with adjustable rates for the average buyer was key. That was clearly what caused the housing bubble in the last decade. There was an absence of underwriting coupled with securitization (caused by the Fed mispricing the risk of mortgage backed bonds), so banks did not have to keep the loans. Once banks could no longer securitize, as the repo market broke due to suspect MBSs, the machine of securitization was prevented from working. Banks had to keep their loans and IOR came into the picture. The IOR Conundrum was put in place.